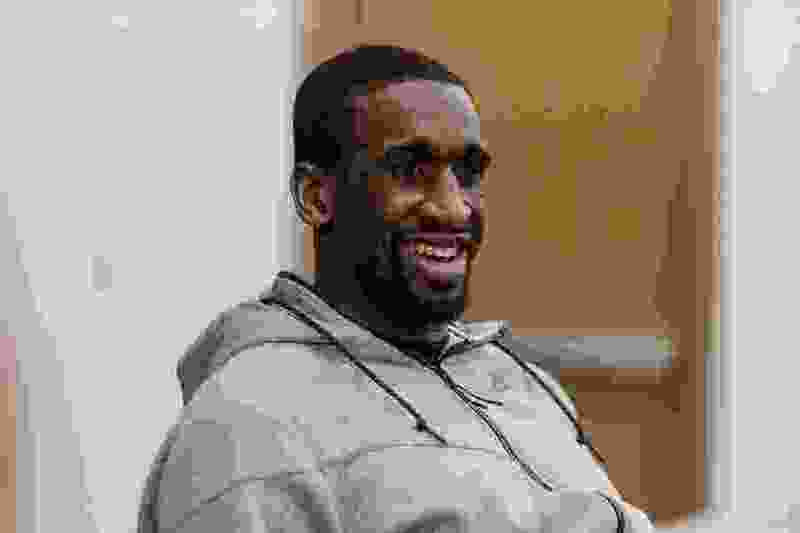 (Trent Nelson | The Salt Lake Tribune) Utah Jazz center Ekpe Udoh during a meeting of his book club in Salt Lake City, Thursda,y Dec. 28, 2017. Oklahoma City • Ekpe Udoh may be a native son, but in Oklahoma this week, roots have been momentarily pushed aside. Guy Hardaker, who hails from the northern Oklahoma City suburb of Edmond, is with the rest of his state this week, hoping the Thunder will prevail. But there’s a part of his heart set aside for Udoh, one of his greatest pupils, and — well, sometimes loyalty has layers. Udoh, 30, makes himself hard not to love in the eyes of Oklahomans. While basketball has flung him far afield from Oakland to Istanbul, the 6-foot-10 center always comes back home. In Edmond, his hometown, he is known for annual summer camps for up to 120 kids. The camps include basketball instruction from him, a gaggle of his boyhood friends and usually one or two special guests (one year, Jamal Crawford came). It comes with lunch — oh, and it’s free. That last part, that’s what’s most important to Udoh, who pays for the camp completely out of pocket and relies on volunteers such as Hardaker to be counselors and organizers. 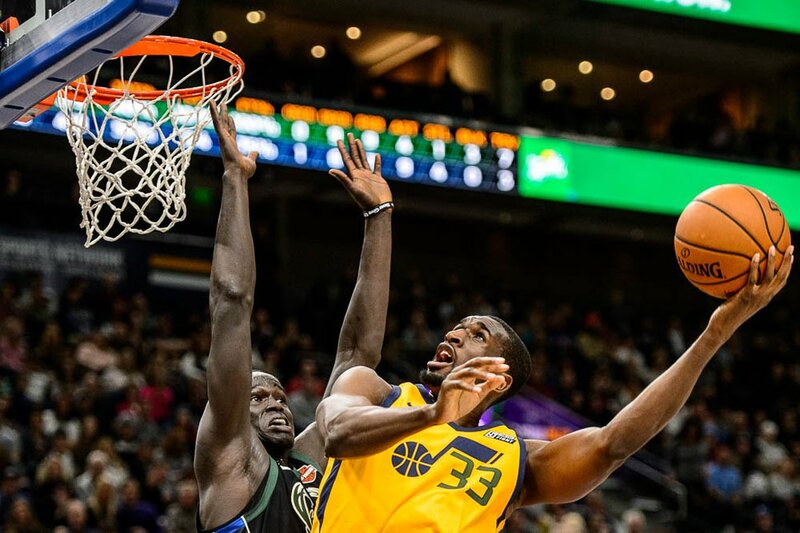 That philosophy on philanthropy leads Udoh to do a lot of things: It’s a reason he does his book club in Salt Lake City, meeting face-to-face with people to show how much he cares about literacy. He likes to visit schools and meet with teachers — raising teacher salaries and funding nutritious lunches are two big social issues that are close to his heart. Hardaker said he’s heard reports of Udoh passing out turkeys on Thanksgiving. Udoh is sometimes coy about how he gives back to the community, and he doesn’t confirm everything. But he clearly gives back. Udoh tries to create moments like the one he experienced in the second grade. Guy Hardaker’s wife, Tammy Hardaker, taught his class, and she asked if Udoh wanted to come watch a basketball game at Santa Fe High, where Hardaker coached. After receiving permission from his parents, he went, and from then on, basketball was a major force in his life. But he wouldn’t have reached the heights he has without a lot of help. Primarily he credits the structure from his parents, Simon and Alice Udoh, industrious Nigerian immigrants who ingrained in him a work ethic and desire to learn. But he also got help from the Hardakers, the Shaws, the Bradfords — families around Edmond who coached him, taught him, paid for his trips and AAU fees and helped him grow. That’s one of Udoh’s big missions now: He’s filed paperwork to set up a nonprofit, in the hopes that it will help him run his camps and further enable more charity work in Oklahoma and other places he’s been. It’s still unclear what the full scope of his charity work will be, but certain issues close to his heart — particularly the Oklahoma teachers’ strike in the past two weeks — might be at the top of the list. Udoh has aspirations of someday opening his own charter school. He’s studied the issues, including that Oklahoma is 48th among states in teacher salary, and he hears anecdotes of old, torn-up and out-of-date books. (Trent Nelson | The Salt Lake Tribune) Utah Jazz center Ekpe Udoh (33) shoots the ball as the Utah Jazz host the Milwaukee Bucks, NBA basketball in Salt Lake City Saturday, Nov. 25, 2017. To the people who have watched Udoh grow up in Oklahoma, or even the ones who are just meeting him now, it’s clear that he stands firmly for making people’s lives better. The core of that effort, as it’s always been, is in his home state. Santa Fe is starting a Hall of Fame for its alums in the next year, and Udoh will be in it. But as numerous as his athletic achievements are, his desire to help others is on track to become his larger legacy.